Just me and my media team buds after last year's race. Baseball and beer? They go together: You’re most likely going to sip—or slam—a brew when you’re at the ballpark. Baseball and brats? Maybe it’s a brat or maybe it’s a hot dog, but it’s the meat in a bun that you’re ordering at the concession stand before the 7th inning stretch. But baseball and running? Sure, there’s plenty of running on the field between rounding the bases and sprinting for fly balls. 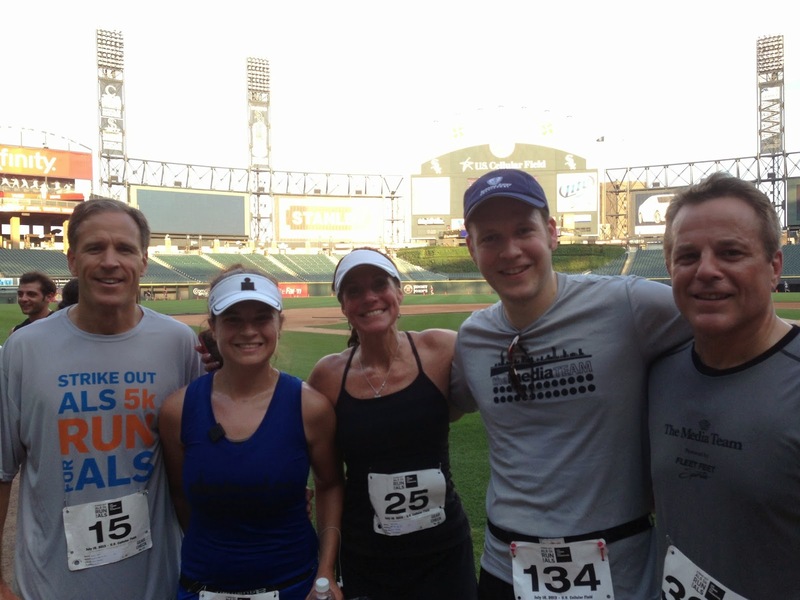 But if you really want a connection between the two sports, or just run a 5K anywhere besides the lakefront or Lincoln Park, you’ll find it at the Strike Out ALS 5K, which does a riff on Take Me Out to the Ballgame that any runner can appreciate. The Strike Out ALS 5K trades the typical Chicago 5K backdrop—the lakefront, the park, the city streets—for one of the ballpark variety with a course that starts outside U.S. Cellular Field, home of the White Sox, and finishes inside with a loop around the warning track (or at least that's how the course flowed in 2012 and 2013, but more to come on that.) And as its name would imply, it’s a race that sticks with the baseball theme from its location to its beneficiary. The 5K serves as a fundraiser for the Les Turner ALS Foundation, which is “Chicago’s leader in research, patient care, and education about ALS,” according to its website. ALS, short for Amyotrophic Lateral Sclerosis, is also known as Lou Gehrig’s disease, and Gehrig was one of the most iconic and respected players in baseball who unfortunately had to quit the game far too soon. Maybe it’s because I can’t refuse a good 5K or maybe it’s because I’m a baseball fan (maybe not a Jimmy-Fallon-in-Fever-Pitch superfan, but I have enough books on the Cubs, Yankees and Brooklyn Dodgers to probably seem crazy.) Either way, this race is hard for me to resist. I think the only reason I missed it its first year—the race turns five in 2014—is because I had just completed Ironman No. 2 days before and running was the last thing on my mind. I plodded my way through it in 2011 as my first run post-stress fracture. I shuffled through it in 2012 when my leg cramped up. I accidentally cut about a quarter mile off the course last year—I swear I just followed who I saw in front of me—when I missed a straightaway and found myself hitting the warning track from center field. And I’m already signed up for this year’s event on Tuesday, July 15, which promises to be even better than it’s been in the past. the warning track at U.S. Cellular Field. As Strike Out ALS turns five, the race will have new course with entertainment at each mile. 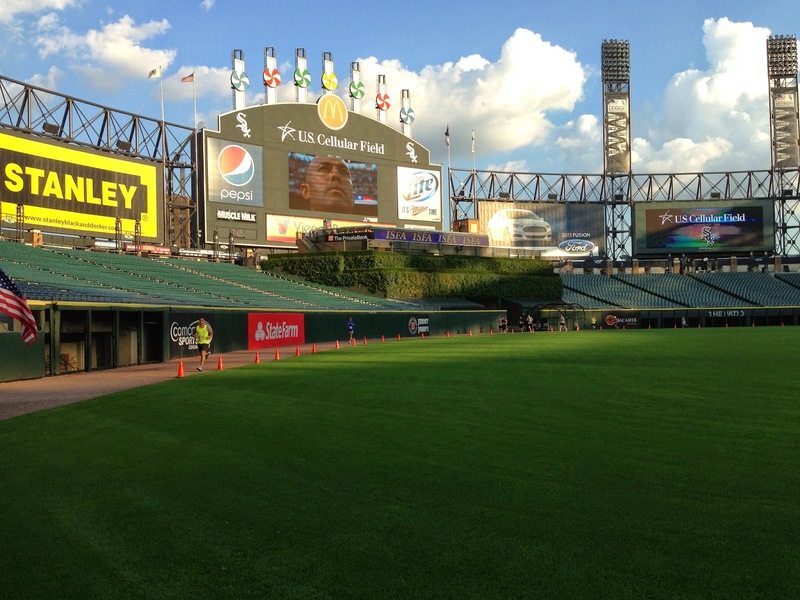 Instead of hanging out in the stands to watch the All Star Game on the big center field screen after running, the post-race party will be at the ChiSox Bar & Grill where runners can feast on a special discounted menu and $3 beer while listening to the tunes of Daredevil Sunday. But one thing won't be changing when this race kicks off at 6:30 p.m.: It's helping those who are living with ALS and remembers those who have unfortunately lost their battle with the debilitating disease. Simply comment on this post, saying that you'd like to be entered in the giveaway by 11:59 p.m. CST on Thursday, July 10. We'll draw one name and announce the winner--plus tell you offline how to get signed up. Why so early for a Tuesday race? Because we want to make sure you don't miss the online registration period, which ends at noon on Friday, and have a chance to pick up your packet on Sunday, July 13, if you don't want to wait until race day. For more details on the event or to make a donation, check out strikeoutals.org. And comment below if you want to run in 10 days! I'd love to win a free entry!! Looks like a lot of fun! Congrats Brooke, you are the winner of the 5K entry. I will send you the registration details, just be sure to register this morning as online registration closes at lunchtime. thanks for entering!